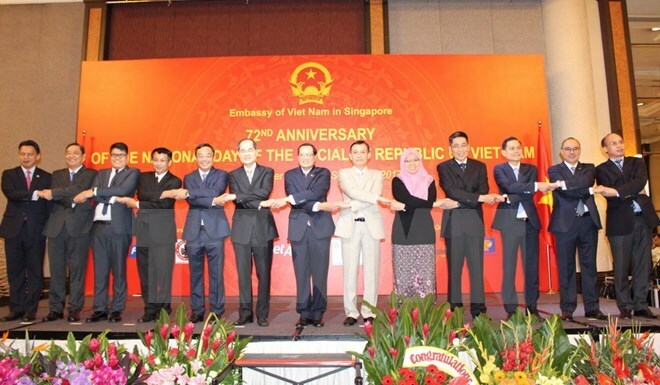 Singapore (VNA) – Singapore is always an important partner of Vietnam during its development process, said Vietnamese Ambassador to Singapore Nguyen Tien Minh at a meeting on August 29 to mark Vietnam’s 72nd National Day (September 2). According to the diplomat, on the basis of the strategic partnership set up in 2013, Vietnam and Singapore have intensified cooperation in numerous fields, including security, defence, trade, investment, education and tourism, with trade and investment being a bright spot in the bilateral relations. In the past three years, two-way trade recorded an average annual growth rate of 12 percent. Last year, bilateral trade reached 20 billion SGD (approximately 15 billion USD), making Vietnam become Singapore’s 11th largest trade partner. Singapore is Vietnam’s third biggest investor, with over 1,900 projects worth nearly 42 billion USD. Minh expressed his belief that the visits made by the two countries’ senior leaders, especially the visit to Vietnam by Prime Minister Lee Hsien Loong in November will help lift the bilateral relations to a new height. In the context that the Association of Southeast Asian Nations (ASEAN) is celebrating its 50th founding anniversary, Vietnam pledges to work with other member states in building an ASEAN Community of peace, solidarity, development and prosperity, which holds a central role in the region’s security architecture, he added. Singaporean Minister for Trade and Industry Lim Hng Kiang said that Singapore continues to be Vietnam’s development partner through technical assistance and cooperation in various fields, including education, finance, tourism and transport.